Coming through a very long, very dreary, very cold winter, we were looking for any excuse to have a festive get-together at home. Not being devout or religious, I don't recall any specific Easter traditions while growing up, but I suppose it's never too late to start. This year Easter Sunday, I had been hoping for good weather, but the forecast said that it was going to rain all day. People we invited were still coming and we were determined to have a good time amidst the rain. For some reason, my brother had ordered a whole case of bratwursts and this was a good time to cook the whole lot. I proceeded to boil them in some beer with onions. I had planned to finish them up on the grill outside on the deck, but the weather was not cooperating, so I just finished them on a grill pan. 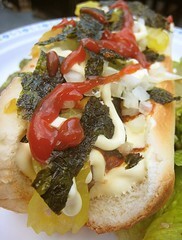 I'm sure a lot of you have heard of Japadogs, as they were featured on No Reservations with Anthony Bourdain. 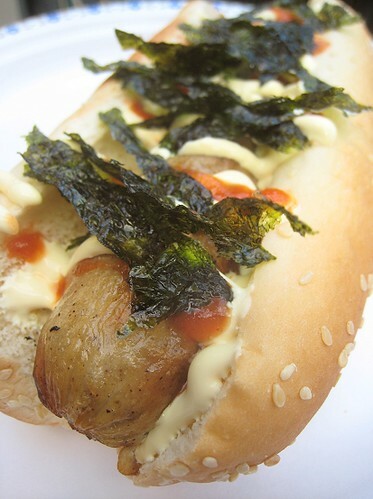 As the name suggests, these are hotdogs that are "Japan-ified", with toppings such as Japanese mayonnaise and nori (seaweed). For our "indoor barbeque" get-together, I decided to prepare "Japadog"-inspired toppings -- Japanese mayonaise, pickled daikon radish, and shredded nori -- in addition to the usual suspects. 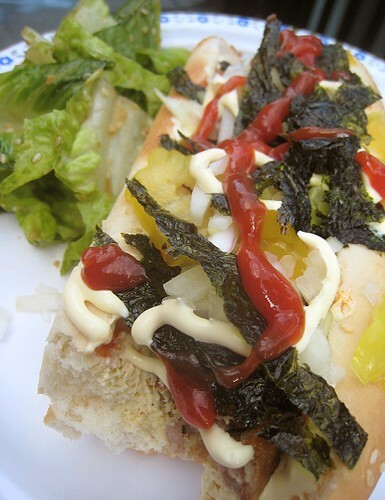 The brat above was topped with banana peppers, chopped onions, Japanese mayonnaise, ketchup and nori. This one simply had a little bit of ketchup, then Japanese mayonnaise and nori. Other people mixed and matched the condiments to taste: yellow mustard, grainy Dijon mustard, chopped onions, banana peppers, Japanese mayonnaise, Hellman's mayonnaise, pickled daikon & carrots, pickle relish, nori, sriracha sauce, Tabasco, and so on. We also served this Korean romaine salad. The dressing had soy sauce, chili flakes, sesame oil, garlic, ginger and green onions. Some people even put the dressed romaine inside the bun with their brats. Great idea. These Grilled Brats à la Japadog were a big hit! The case of brats had 40 pieces; there were only 6 left at the end of it all. I still haven't had a real Japadog. Maybe someday, when I'm in that area. I'm not making a special trip, OK? ;) Otherwise, our version was not too bad at all. Not bad at all. the brats and the way you cooked them (beer and onions) was german-style, japanese-garnished for an overall-american concept.. wow, amazing! 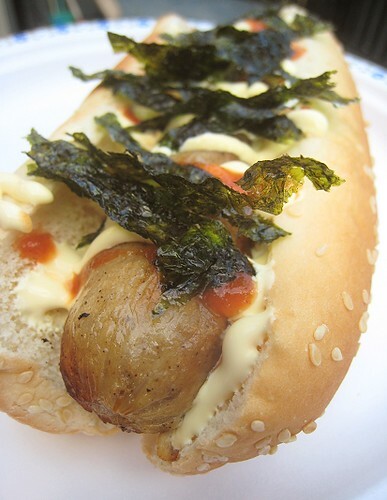 would love to have a japadog one day too..i wonder if wasabi would work instead of mustard? hmmnnn..
Oh man, you're making me crave a Japa-Dog! Well I am defineately out of the loop as I have never heard of a Japa-dog till now! Sounds interesting thought. What a great asian twist to an otherwise all american meal! Bravo! The only thing different from Japadog's terimayo is a bit of teriyaki sauce. Yours probably tastes better with the beer + onion bath. I've seen the lineups on Burrard for those Japadogs! I hate lineups, I'll make yours. I bet they are better than the street ones. I've never heard of Japadogs actually but they do look GOOD! Inspired, indeed. These Japadogs look lovely. Might inspire us to try some out ourselves. Haha, I didn't even realize that we went so "international" with out brats. =D Oh! Yeah, wasabi would be great! Haha... one day I will have one... One day. They actually have 2 "locations" (carts) now. I don't think anyone would make this at home! They would just grab one off the street. Hehe... I'm just too lazy to go all the way to Japadog to get them. Haha... Wonder if they take menu suggestions. They have 3 stands now, I hear! Why ketchup? Put teriyaki sauce on it,Please. I love brats! I think a brat fully loaded with all these goodies would be delicious. Unfortunately I missed the Anthony Bourdain special on the japadogs, but I get the jist of it. Great job-- yum. You didn't miss much. ;) Just do your own take on a "japa" dog.